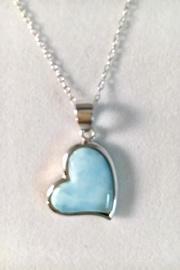 A lovely heart pendant crafted from sterling silver and larimar, a super trendy and pretty light blue stone. The heart measures approx. 5/8 x 3/4 and hangs on a 16 sterling chain.